Michael Kruzich (American, b. 1964). Refuge, 2017. Stone, Italian smalti, and gold. 60 x 36 inches. 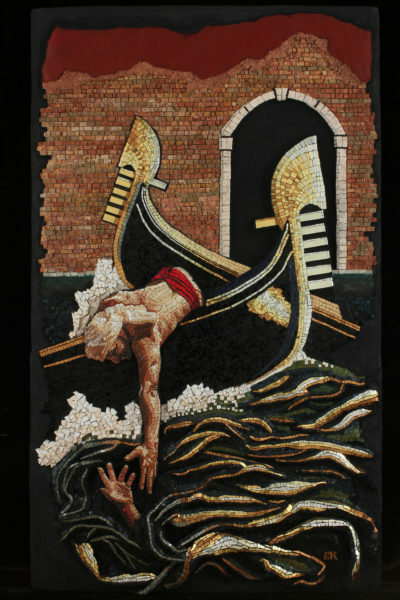 Vanderbilt Fine Arts Gallery is pleased to present Embodied: Mosaic Arts International 2019 Invitational, an exhibition surveying figurative works by five renowned mosaic artists working today: Lilian Broca (Canada), Shug Jones (United States), Michael Kruzich (United States), Atsuko Laskaris (Japan) and Carol Shelkin (United States). The exhibition is held in conjunction with this year’s American Mosaic Summit, taking place in Nashville from April 23 through 28. The contemporary mosaics on view aim to capture the personal histories, preserved memories, and emotional occurrences of everyday life. Through meticulous manipulations of glass, stone and ceramic, these detailed works achieve a dynamic range of color, texture and reflectivity. Their durable materials and methods do not stray far from those from antiquity. Neither do their stories: Scenes presented in Embodied share timeless themes of love and family, conflict and war, spirituality and society. This exhibition is supported, in part, by the Society of American Mosaic Artists. Since 1999, SAMA has presented programs, publications, events and exhibitions that promote, educate and inspire excellence in mosaic arts. Mosaic Arts International is the longest running annual juried exhibition showcasing mosaic art in the world. This year, SAMA’s annual conference, the American Mosaic Summit will be held at Sheraton Music City Hotel from April 23–28. In conjunction, several other exhibitions will take place across Nashville, including the 2019 Mosaic Arts International Juried Fine Art Exhibition at the Parthenon Museum and the Mosaic Arts International Juried Architectural & Site-Specific Exhibition at the Nashville Public Library, Main Branch Art Gallery (both, January 26–May 19). Find more information, as well as conference registration information, here.